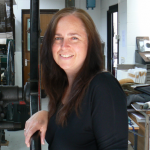 Tracy Hill is an artist and Senior Printmaking Technician at UCLan. Her research examines how the conventional processes of printmaking and new developing technologies can be combined to produce innovative ways to challenge the definitions of print. Hill is developing strategies through her research to form collaborative partnerships between other professional facilities. In 2011 she accepted an international residency at Pyramid Atlantic print studios in Washington DC where she shared research on developments in acrylic grounds. Hill has shown works across the UK and internationally most recently in Krakow, Australia, Bulgaria, Canada, China, Germany, India and Serbia. Co- presented with Tracy Hill.